Nearly every office has outspoken individuals who question others’ work in public. A professor of mine once told me, “There are two reasons people ask a lot of questions: they’re lazy and trying to avoid work, or they’re critical thinkers and trying to come to a solution.” It’s often hard to sort out what kind of worker outspoken individuals are, and unfortunately, office managers can’t look into a crystal ball and see the future turnout of outspoken employees. This strategy calls for thick skin to take criticism, but allows for direct, to the point debate over the issue at hand. Criticism can be hard to take in public, but in a private setting, ask the outspoken person to be straightforward and voice their opinion of whatever it was they were questioning. This will hopefully lead to thoughtful criticism and might prove to you that your idea needs reworking, or might clarify for the outspoken individual whatever it was the confusion was about. This could also expose the outspoken individual as not having any real criticism or ideas for how to fix the problem, and simply trying to avoid work. The main goal for this strategy is to empower the outspoken individual. While it may sound ridiculous to give the same person you’re debating whether or not is a critical thinker or lazy a leadership role, this strategy will solve the debate once and for all. Think of this strategy like fixing a leak. Giving the outspoken individual more responsibility could be just what they need to harness their passion and you could have discovered a rising star in your organization. In this case, the leak is sealed. On the other hand, this outspoken person could have been avoiding work in the first place and may hinder a project if given more responsibility, just like how trying to fix a leak can sometimes drip more water into the room. Either way, avoiding the leak doesn’t solve anything and will continuously dampen your organization. Sometimes the best way to go about someone challenging you is to bring a third party in. The outspoken individual might not have a problem with your plans, but with you as a person. 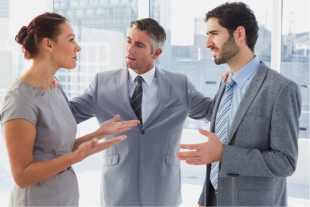 Talk to another manager or your HR department about mediating a discussion to avoid a heated argument that could upend the project you are working on. This is the safest way to confront the issue. The next time that outspoken person in your office questions your work, try to think how you can benefit from the challenge. You may expose the person as trying to avoid work. On the other hand, you just might discover the next leader for your organization who can use that rebellious passion to move your organization forward.